Queen Victoria was the longest reigning monarch of the United Kingdom. From 1876 she was also Empress of India. Appointment by Victoria of Henry Churchill as Consul-General to Syria. Very fine, large bold autograph signature at head of a document. 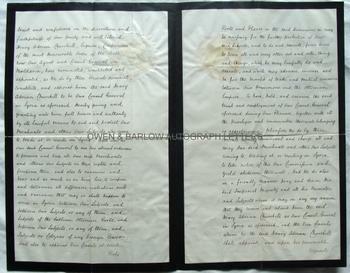 An attractive document on vellum parchment with mourning edge. 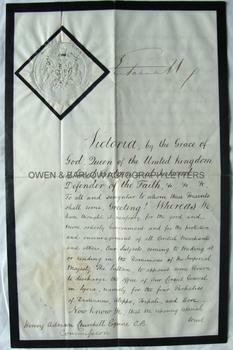 The Royal seal on impressed paper is affixed at top left. The Appointment also bears the autograph signature of Prime Minister Lord John Russell on last leaf. Dated 8th December 1862. 4pp. Folio. Approx 15 x 9.5 inches. 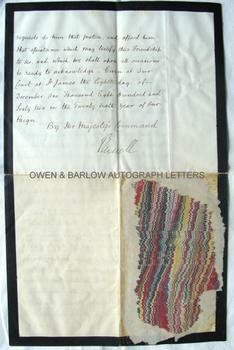 The document has been twice folded and, at some time in the past, had been bound into a book or folder (probably by Henry Churchill himself as some kind of diplomatic passport) with the residue of a marbled endpaper on the lower right quadrant of the last leaf (not touching any part of the text or signatures). Some browning and offsetting from the paper seal but all else in fine condition. Henry Adrian Churchill (1828-1886) had previously been Victoria's Consul in Moldavia. He was an archaeologist and friend of fellow archaeologist William Kennett Loftus. As part of the 1849-1852 Turco-Persian Frontier Commission, he (then aged only 21) and Loftus had crossed the deserts and marshes of Chaldaea, with a detachment of troops, making observations of archeological remains from the Euphtates to the Lower Tigris. In 1850 they carried out excavations at the ancient city of Uruk, which they had discovered the previous year. Loftus went on to carry out excavations at Nineveh and Nimrud and died at sea when returning to Britain.